So starts the group read through of The Hobbit, or There and Back Again. 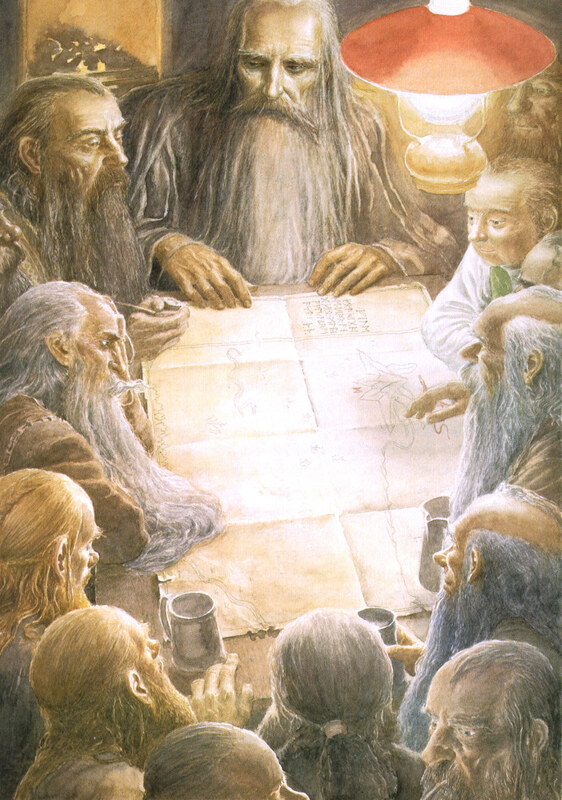 I'm blessed with owning the Alan Lee illustrated sets of The Hobbit and the Lord of the Rings, so I'll be pulling from his gorgeous work in these posts. There is something just welcoming and magical about the opening of The Hobbit. The language manages to be both simple and rich, the words familiar and warm. Tolkien gives us several pages of setting and exposition before the first words spoken, teasing us along until he delivers us at Bilbo's doorstep with Gandalf. And this whole opening is what Peter Jackson got so right in his film adaptation. The familiar words honestly made me tear up. We already knew that Ian McKellen was an amazing personification of Gandalf, but Martin Freeman became Bilbo Baggins. 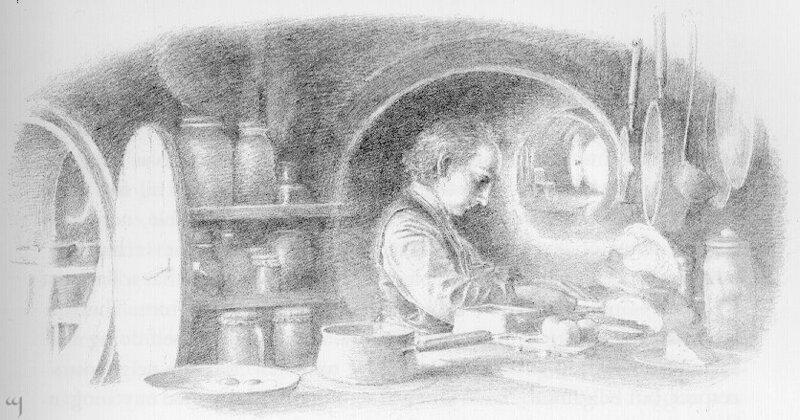 Jackson even took a band of barely discernable dwarves and turned them into distinct individuals. I wonder how much some of the changes Jackson decided to make would have caused outraged had he not hit exactly the right notes at the beginning. I often have difficulty with music/poetry in stories, and when I was little, I definitely just skipped over the songs. What Tolkien did so well however was to give us songs that are polished and solidly connected to the story itself. The songs themselves work as spoken-word, which lends itself well to reading out loud. Chapter one clearly informs us that there is evil and darkness in the world, creeping dangers beyond that of a conquering dragon who has laid claim to an ancestral kingdom. We learn of wars, of dungeons, of madness, and Necromancers. For me, The Hobbit, is not a book that belongs categorized specifically as a children's or an adult's book, it bridges across the age groups. It's a delightful fantasy read, and chapter one sets the stage for the entire story. Young readers may have been the intended audience, but the story assumes that the readers are curious and inquisitive, providing details beyond the immediate concerns. The readers, child or adult, are sharing Bilbo's experience. We're drawn out of our normal, everyday life, into a perilous adventure from which we may not return.